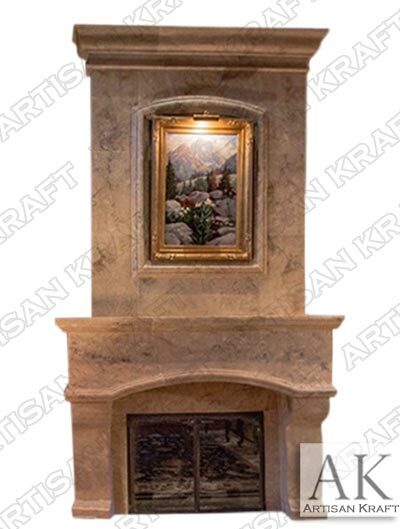 This Houston Overmantel Fireplace is made from Antique Travertine. A traditional design with arched picture frame in the upper cladding that matches the firebox arch. Color tones of the stone go perfectly with the color of the wall. Traditional mantel shelf with more steps in the upper crown shelf. Corbel legs with a curved top and flat pilasters on running down. As with all of our overmantels this is priced custom.